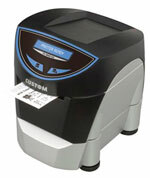 CUSTOM ENGINEERING and ASK have partnered on a new thermal ticket printer. The new CUSTOM printer integrates ASK UCM108 coupler module to personalize both graphically and electrically contactless paper tickets, either in rolls or fan fold form factors. This personalization can be done at the same time, in a smooth and quick operation. The printer comes as an OEM printer to be integrated into a system integrators’ equipment or as a desktop printer. This new RFID printer is suited for ticketing in transport, entertainment, sports events or any access control application requesting contactless paper tickets.